These 100% solid stainless steel ball bearing swivels are the highest quality American made smooth rolling ball bearing swivel available. Stainless steel ball bearings ensure strength and reduces friction. Made in USA. 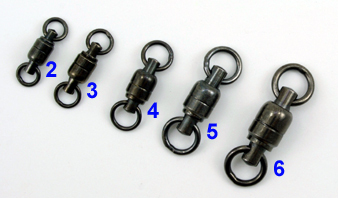 Small Eye Swivel: has two small eyes to accept 2 fine wire split rings. Large Eye Swivel: has one small eye and one large eye (0.064" diameter). Requires only one split ring. These heavy duty feature solid stainless ball bearing swivels are highest quality smooth rolling ball bearing swivels available. Stainless steel ball bearings ensure strength and reduces friction. 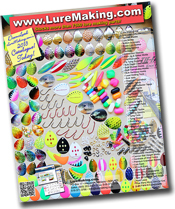 Must have for all muskie, pike, salmon and saltwater anglers. Solid Welded Rings ensure no split ring failure. Black nickel finish! * O.A. length includes both welded rings.